Becoming a personal trainer can prove to be one of the most rewarding careers you could take on. Helping clients to get in shape and take control of their lives is one part of the job that many others do not enjoy. The Fitness Trainer Academy is your source for the best personal trainer certification in Houston, delivering comprehensive courses and hands-on learning to give our students all of the tools they need to thrive in the field. You can become a National Academy of Sports Medicine (NASM) trainer with our quality teachings. 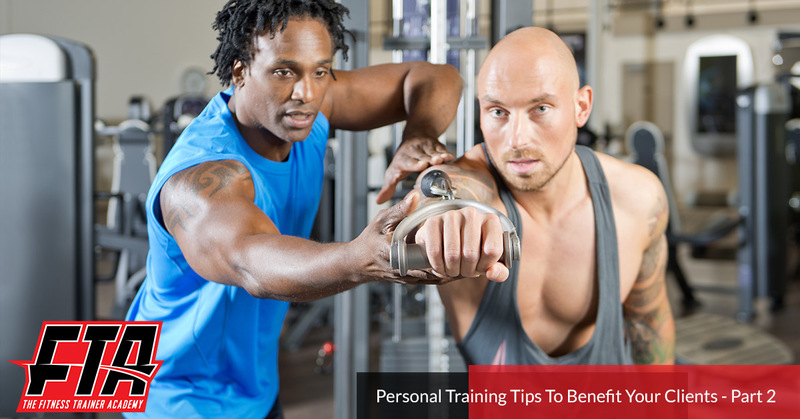 Today, we’ll build on last week’s blog that focused on personal training tips that you can focus on to benefit your clients more than ever. From sports nutrition certification to business management tips, we’re here to deliver the best tools possible! One of the most common statements you’ll hear is “The health aspect is great, but I really just want to look good!” While we understand the value of having that godlike physique, it’s important for you as a certified personal trainer to focus on the overall health of your clients. Creating a system that focuses on proper diet and fitness will be much more helpful in the long run in comparison to focusing on looking good. It’s on you to help people live a long, healthy life. As our sports nutrition courses will dictate, diet has a major effect on fitness and weight loss. When your client shows up for their first session, it’s wise to promote nutrition and hydration through every step of the process. Keeping a balanced diet and optimal liquid intake will help people to thrive and progress, making everyone involved feel great. Be sure to promote a healthy meal and adequate water during the workout, where ingraining these habits is a wise practice. Eating clean and drinking plenty will help you all to have a more productive session! Many citizens join a gym with the intention of seeing those LBs drop off the scale. While weighing yourself is good for measuring weight loss results, it’s not a solid indicator of overall health. Initially, the loss of water weight will give clients a source of excitement, where the pounds are just shedding off. Once hydrated, though, the weight comes back. As people begin to work out more, their muscle mass increases. This increase in dense muscles may reflect on the scale, where you feel better but your weight is still increasing. Keeping your clients’ attention off of the scale will keep them motivated and keep you in place as a trusted source for fitness! When it comes to becoming an NASM trainer, you’ll be expected to provide the best instructions and optimal results. It’s important to focus on a few areas that often slow down people’s results, putting it on you as the fitness guru for solutions. Next time, we’ll conclude this blog series by discussing a few more tips that can help your clients get in shape and feel good quicker and with less frustration. The Fitness Trainer Academy provides the best personal trainer certifications in Houston, delivering comprehensive instruction with guidance and clarity. Contact us today to sign up for our personal trainer courses!